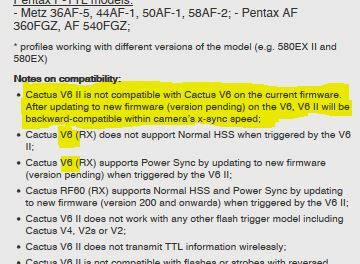 You need to wait for a new firmware for the Cactus V6, not the V6 II. I know it's in the fine prints, but they are important to note. I understood that Cactus V6 firmware will be upgraded, I have patience. But the issue I am having is with two brand new VII units (as mentioned earlier before I bought a set). These new units simply won't get up and running to do the job. Did the V6 TX unit auto-detect the camera as Nikon? You may also manually select the camera system. I suppose both the SB-800 and SB-900 are set to TTL mode? Did you turn on the flash first before switching on the V6 II to RX mode? It will auto-detect the flash system and applies an AUTO flash profile. You may also manually choose the corresponding flash profile.